Introduction: Oral leukoplakia, oral submucous fibrosis, and oral lichen planus are the precancerous or potentially malignant lesions and conditions whereas oral squamous cell carcinoma (OSCC) is a cancerous or malignant lesion of the oral cavity. They have characteristic clinical and histopathological features. These diseases not only originate from epithelium but also associated with chronic inflammation juxta-epithellialy. Mast cells present in the connective tissue stroma and release pro-inflammatory and mitogenic cytokines. These functions of mast cells contribute and enhance the pathogenesis translation of diseases. Aim: The study was done to histologically evaluate the number of mast cells in oral epithelial dysplasia and OSCC and compare it with normal oral mucosa (NOM). Materials and Methods: Forty-five cases each of oral dysplasia, OSCC and ten cases of NOM were studied for mast cell number using toluidine blue. Results: There was a highly significant increase of mast cells in oral epithelial dysplasia on comparison with OSCC whereas there was only a significant increase in mast cells in OSCC on comparison with NOM. Conclusion: The literature has proven that mast cells can be an indicator of increased angiogenesis and hence can help in the prediction of carcinogenesis, its progression, and also the prognosis of the malignant lesions. Oral leukoplakia, oral submucous fibrosis, and oral lichen planus are some potentially malignant lesions and conditions of oral cavity, whereas oral squamous cell carcinoma (OSCC) is a malignant lesion of the oral cavity. All of these have characteristic clinical and histopathological features. These diseases though being of epithelial nature are at some or the other stages associated with chronic inflammation in their adjacent connective tissue. Mast cells, the local residents of the connective tissue, are associated with the release of certain pro-inflammatory and mitogenic cytokines. These substances, when released from the mast cells, may play a significant role in the pathogenesis of diseases. Oral epithelial dysplasia is the diagnostic term used to describe the histopathological changes seen in a chronic, progressive, and premalignant disorder of the oral mucosa and can be encountered in previously mentioned lesions. If any of these pathologies are left untreated or if the causative factors are not removed, they can progress to OSCC. According to Nagpal and Das, OSCC or oral cancer is an epithelial neoplasia generally seen as a focal clonal overgrowth of altered stem cells near the basement membrane, expanding upward and laterally, replacing the normal epithelium. Mast cells are major immunoeffector cells of connective tissue; they are well-engineered, multifunctional cells which play a central role in acquired and innate immunity and have a phagocytic function that might thereby contribute to host defense. They are heterogeneous in shape (round, oval, or spindle-shaped) having a diameter of about 12 microns, with a life span of weeks to months. Mast cells are highly granulated cells packed with 50–100 granules. They originate from bone marrow and are normally distributed throughout the connective tissue. These cells are an important source of several proangiogenic and angiogenic factors such as histamine, heparin, chymase, FGF-2, and VEGF. Cytokines released by mast cells such as IL-3-induced basophil recruitment and activation, IL-5-induced eosinophil recruitment and activation, and IL-13 induction of IgE synthesis by B cells. They migrate from blood vessels into the sites of inflammation, and this provides an opportunity for these cells to interact with the endothelium and its surrounding basement membrane components. They are phylogenetically old, granulated cells, already known by their key role in type 1 hypersensitivity reactions. The activation of these cells has been proved to have many biological consequences such as mitogenesis, angiogenesis, and augmentation of microvascular hyperpermeability. Increased angiogenesis has been associated with neoplastic progression and metastasis. The accumulation of mast cells around tumor margins and the release of potent proangiogenic and angiogenic factors may represent a tumor–host interaction which probably favors tumor progression. Hence, Yodavudh and Gulubova suggested that a mast count could serve as a useful prognostic tool for patients after surgery., It has been reported by Chan that the mast cell accumulation can be estimated by counting the mast cell density. Mast cells are able to produce a wide spectrum of mediators creating reciprocal functional interaction between mast cell activation and subsequent T-lymphocyte stimulation. Adhesion of mast cells to the extracellular matrix (ECM) is important for homing of precursor mast cells to lesional tissues and their subsequent movement from the vascular to the extravascular compartment of oral mucosa. The vascular subendothelial basement membrane contains laminin, and this has several distinct cell-binding domains that can be recognized by mast cell surface receptors. This potential interaction between the mast cell and basement membrane laminin is capable of inducing a number of biological responses. A study done by Walsh et al. has shown that a large proportion of the connective tissue mast cell population in oral lichen planus is associated with laminin. The selective and specific identification of mast cells in the connective tissue is generally based on the staining properties of the sulfated mucopolysaccharides of the granules and activity of the trypsin-like esterase enzyme in the matrix of the granules. For a demonstration of mast cells, metachromatic staining with basic aniline dye, especially, toluidine blue has been widely employed. Not all mast cells in the mast cell population attain the levels of metachromasia which are characteristic of sulfated compounds. The younger, immature cells are seen to bind little or no dye. Toluidine blue is a basic thiazine metachromatic dye with high affinity for acidic tissue components, thereby staining tissues rich in DNA and RNA. It has found wide applications both as a vital stain in living tissues and as a special stain owing to its metachromatic property. Toluidine blue has been used in vivo to identify dysplasia and carcinoma of the oral cavity. 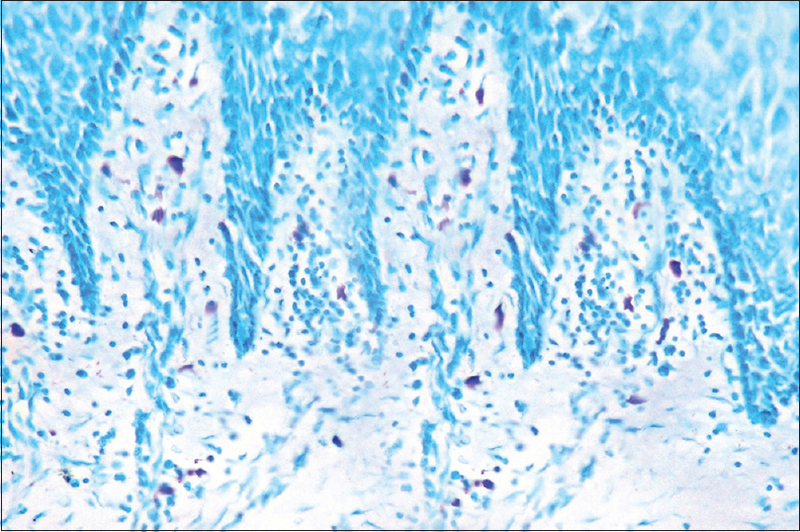 Use of toluidine blue in tissue sections is done with the aim to highlight components such as mast cell granules, mucins, and cartilage. Toluidine blue has been known for various medical applications since its discovery by William Henry Perkin in 1856, after which it was primarily used by the textile industry. It is also known as methylaniline or aminotoluene, it basically has three isoforms, namely, ortho-toluidine, para-toluidine, and meta-toluidine. Solution of toluidine blue exhibits three different absorption maxima, depending on the degree of polymerization of the dye. The dye exists from a normal monomeric (orthochromatic) form to a potential polymeric (metachromatic) form. There are three forms of metachromasia, alpha (α), beta (β), and gamma (g) giving a range of colors. The present study was accomplished to evaluate the number of mast cells in oral epithelial dysplasia and OSCC. The material for the present study included 100 formalin-fixed paraffin-embedded tissue blocks comprising 45 cases of OSCC, 45 cases of oral epithelial dysplasia, and 10 cases of normal oral mucosa (NOM), histopathologically diagnosed (using hematoxylin and eosin), retrieved from the archives of the Department of Oral Pathology, Institute of Dental Studies and Technologies, Modinagar, Subharti Dental College, and other institutions in and around Meerut. Finally, after clearing was done in xylene, the sections were mount in DPX and covered by coverslips. Background – shades of blue. Mast cells were counted using an Olympus CX41 microscope fitted with an Olympus oculometer grid. Counting was carried out at ×40 and was done in six nonoverlapping fields in each slide. 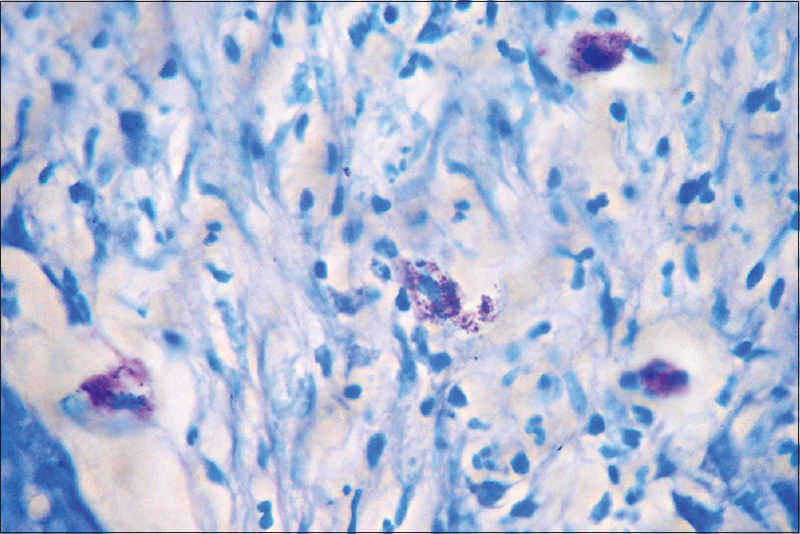 Mast cells were identified on the basis of the purple color attained by the granules after toluidine blue staining, but the nucleus of these cells appeared blue. All the other components of the sections were seen in different shades of blue as shown in [Figure 1], [Figure 2], [Figure 3], [Figure 4], [Figure 5], [Figure 6]. 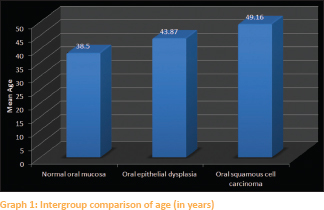 The patients in cases of oral epithelial dysplasia were in range of 23-65 yrs with the mean age being 43.87 yrs [Table 1] and majority patients were males. Whereas in cases of OSCC the age range was 20-80 yrs with mean being 49.16 [Table 1] and majority were also males [Graph 1]. To eliminate any subjective bias, two observers independently evaluated the number of mast cells in each slide. Mast cells were counted using an oculometer grid in six non-overlapping grid field at a magnification of 40X. Mast cells were expressed as the number of mast cells per grid field. Statistical analysis was done using SPSS (Statistical Package for Social Sciences) version 16.0 and Epi-info version 3.0 and the findings obtained by the two observers were subjected to paired t-test. 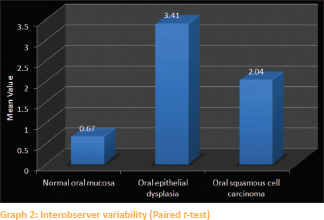 The p-value thus obtained was found to be non-significant in all the three groups i.e., oral epithelial dysplasia, OSCC and normal oral mucosa [Table 2]. Thus mast cell counts by only one observer were considered for further statistical analysis [Graph 2]. 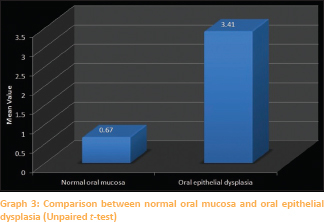 In the present study when toluidine blue stained sections of normal oral mucosa and oral epithelial dysplasia were compared and the p-values obtained on using unpaired t-test were found to be very highly significant (P = 0.001) [Table 3] and [Graph 3]. 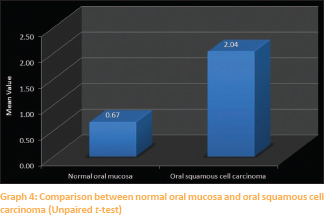 Similar comparision between toluidine blue stained sections of normal oral mucosa and OSCC yielded significant P value (P = 0.049) on applying unpaired t-test [Table 4] and [Graph 4]. Further comparision of the toluidine blue stained sections of the counts of mast cells in both oral epithelial dysplasia and OSCC, yielded a very highly significant P-value (0.000) on applying unpaired t-test [Table 5]. There was a highly significant increase of mast cells in oral epithelial dysplasia on comparison with OSCC whereas there was only a significant increase in mast cells in OSCC on comparison with NOM. With OSCC becoming a major health problem worldwide, there is a lot of emphasis on detecting OSCC and potentially malignant lesion-like leukoplakia in their early stages. 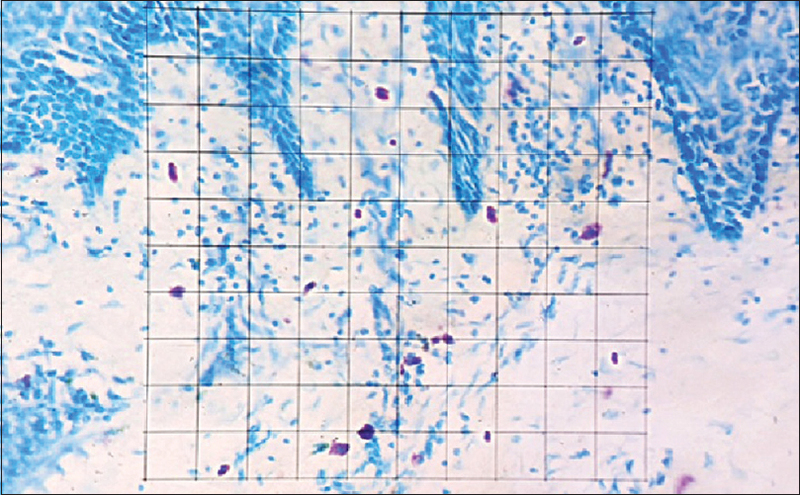 Although there are various immunohistochemical markers available for the detection of both OSCC and leukoplakia, search is still on for cheaper and more widely usable methods such as special stains, for example, toluidine blue and crystal violet which have been studied in the literature to ascertain their feasibility for the same., It was Rudolf Virchow who in 1863 first noted the association between chronic inflammation and cancer. Virchow's hypothesis and studies on the links between cancer and inflammation have a major impact on both its prevention and treatment. Since the inception of the idea of a link between the two, numerous studies have been carried out to ascertain the relationship between inflammation and carcinoma. It has been suggested that if the seed of cancer is genetic damage, then the support provided by some types of inflammation can help in its growth and nourishment. The relationship between solid malignancies and the connective tissue stroma around them has an influencing role in the growth and spread of the malignancy. 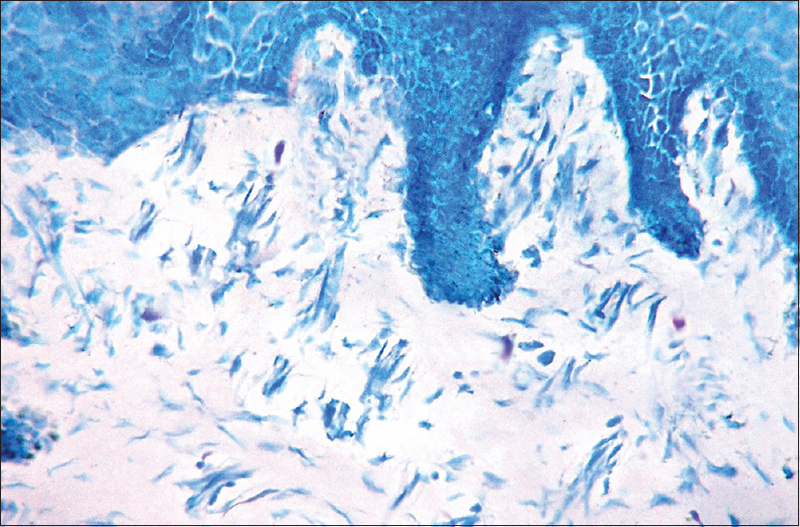 Several characteristics of this surrounding connective stroma have been reported to be similar to the subepithelial changes seen in chronic inflammatory disorders such as inflammatory bowel disease which are associated with cancer development. Stromal cells and their products in association with insoluble ECM components can act as oncogenic agents causing the disruption of the homeostatic regulation of adjacent cells such as tissue architecture, cell death, and proliferation which can lead to the development of solid neoplasia, for example, breast carcinoma. Out of the various inflammatory cells seen such as macrophages, mast cells, lymphocytes, and the various cytokines which are thought to play a role in carcinogenesis, we have studied the density of “Mast Cells” in oral epithelial dysplasia and OSCC and compared them with each other and with the density of mast cells in NOM. The solid tumors require the formation of new vasculature, i.e., angiogenesis for growth. This results from an imbalance between positive and negative angiogenic factors produced by host and tumor cells. Mast cells are an important source of several proangiogenic and angiogenic factors and hence around this area of angiogenesis mast cell density is seen to be high. Mast cell or “Mastzellan” as named by Paul Ehrich in 1877 is a granular cell of loose connective tissue. They are capable of phagocytosis, processing antigens, producing cytokines, and releasing various vasoactive substances and reacting to multiple nonspecific and specific stimuli. The numerous cytoplasmic granules in the mast cells bind to basic dyes such as toluidine blue and show metachromatic staining properties. The pharmacologically active agents in the mast cell granules most likely contribute to the inflammatory reaction seen in epithelial dysplasia. 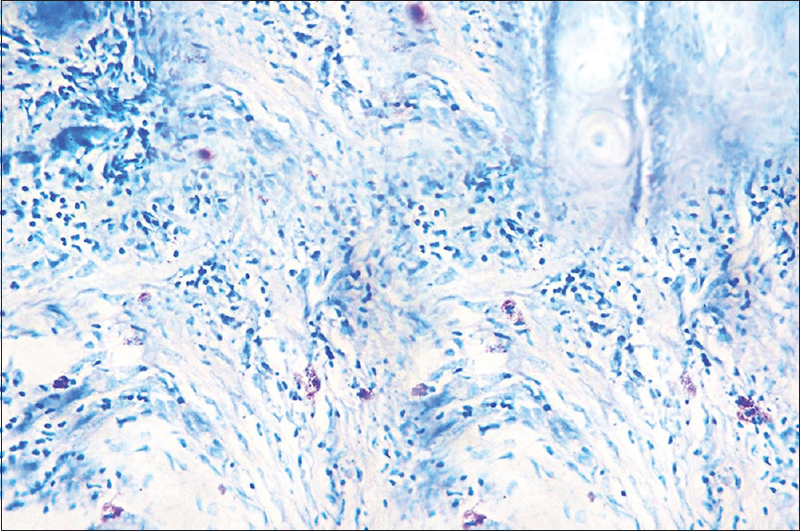 The mast cell degranulation releases IL-1 which may cause increased epithelial proliferation and increased lymphocytic and plasma cell infiltration as seen in leukoplakia. Histamine which is released causes increased mucosal permeability and allows the antigens to reach into the underlying connective tissue. Heparin further causes endothelial cell proliferation and migration which results in increased vascularity of the stroma and in epithelial ulceration. We saw a highly significant increase of mast cells in the case of oral epithelial dysplasia as compared to NOM, and these results are in accordance with the study done by Ankle et al. This though is opposite to what Jandinski et al. reported in their study. There was a highly significant increase of mast cells in oral epithelial dysplasia on comparison with OSCC whereas there was only a significant increase in mast cells in OSCC on comparison with NOM. These findings can be supported by the study done by Oliveira-Neto et al., in which the authors have stated that the decrease of mast cells in OSCC may reflect an important modification in the microenvironment during squamous tumorigenesis and may be related to the failure in migration and/or a local depletion of these cells. In contrast, studies done by Iamaroon et al. and Michailidou et al. have shown a measurable increase in mast cell counts in both oral epithelial dysplasia and OSCC as compared to NOM, with OSCC having a higher count as compared to oral epithelial dysplasia. In the current study, it was observed that using metachromatic dyes such as toluidine blue, the visual detection of mast cells become clearer and hence this could prove to be a reliable method to be used for the same. The reliability of this technique is strengthened by the nonsignificant interobserver variability [Table 2]. However, the findings of the present study should be further consolidated by studies using larger and more varied sample sizes to enhance the acceptability of the technique used in this study. 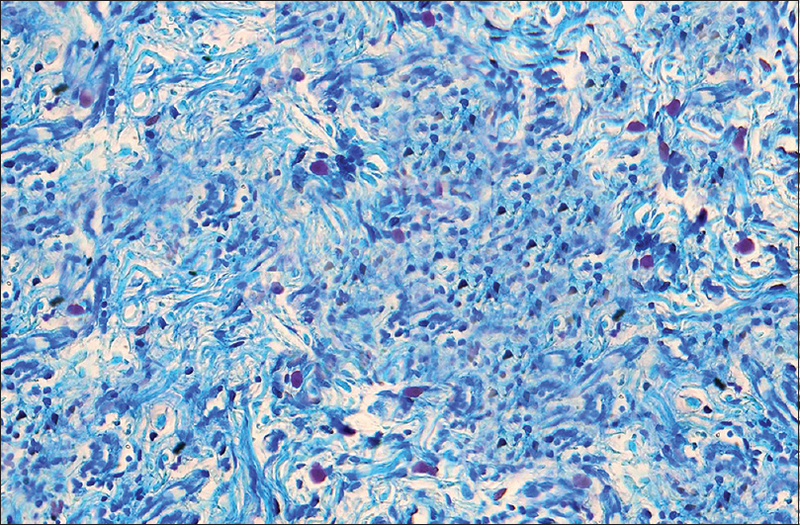 The metachromatic property of the mast cells using toluidine blue stain helps in obtaining a better and more accurate visible distinction of the mast cells in tissue sections. The literature has proven that mast cells can be an indicator of increased angiogenesis and hence can help in the prediction of carcinogenesis, its progression, and also the prognosis of the malignant lesions. The distinct metachromasia of mast cells and their role in the pathogenesis of cancer can together be used for patient welfare. However, more detailed studies using larger and more varied sample sizes are advised to get a better understanding of the role of mast cell density in oral potentially malignant and malignant lesions. Ankle MR, Kale AD, Nayak R. Mast cells are increased in leukoplakia, oral submucous fibrosis, oral lichen planus and oral Squamous cell carcinoma. J Oral Maxillofac Pathol 2007;11:18-22. Nagpal JK, Das BR. Oral cancer: Reviewing the present understanding of its molecular mechanism and exploring the future directions for its effective management. Oral Oncol 2003;39:213-21. Galli SJ, Maurer M, Lantz CS. Mast cells as sentinels of innate immunity. Curr Opin Immunol 1999;11:53-9. Hamm WA, Cormark HD. The origin, morphologies and functions (Including immunological functions) of the cells of loose connective tissue. Histology. 8th ed. Philadelphia: J.B. Lippincott Company; 1979. p. 225-59. Arinobu Y, Iwasaki H, Akashi K. Origin of basophils and mast cells. Allergol Int 2009;58:21-8. Esposito I, Menicagli M, Funel N, Bergmann F, Boggi U, Mosca F, et al. Inflammatory cells contribute to the generation of an angiogenic phenotype in pancreatic ductal adenocarcinoma. J Clin Pathol 2004;57:630-6. Lorentz A, Schwengberg S, Mierke C, Manns MP, Bischoff SC. Human intestinal mast cells produce IL-5 in vitro upon IgE receptor cross-linking and in vivo in the course of intestinal inflammatory disease. Eur J Immunol 1999;29:1496-503. Walsh LJ, Davis MF, Xu LJ, Savage NW. Relationship between mast cell degranulation and inflammation in the oral cavity. J Oral Pathol Med 1995;24:266-72. Metcalfe DD, Baram D, Mekori YA. Mast cells. Physiol Rev 1997;77:1033-79. Michailidou EZ, Markopoulos AK, Antoniades DZ. Mast cells and angiogenesis in oral malignant and premalignant lesions. Open Dent J 2008;2:126-32. Yodavudh S, Tangjitgamol S, Puangsa-art S. Prognostic significance of microvessel density and mast cell density for the survival of thai patients with primary colorectal cancer. J Med Assoc Thai 2008;91:723-32. Gulubova M, Vlaykova T. Prognostic significance of mast cell number and microvascular density for the survival of patients with primary colorectal cancer. J Gastroenterol Hepatol 2009;24:1265-75. Chan JK, Magistris A, Loizzi V, Lin F, Rutgers J, Osann K, et al. Mast cell density, angiogenesis, blood clotting, and prognosis in women with advanced ovarian cancer. Gynecol Oncol 2005;99:20-5. Kulka M, Alexopoulou L, Flavell RA, Metcalfe DD. Activation of mast cells by double-stranded RNA: Evidence for activation through toll-like receptor 3. J Allergy Clin Immunol 2004;114:174-82. Zhao ZZ, Savage NW, Walsh LJ. Associations between mast cells and laminin in oral lichen planus. J Oral Pathol Med 1998;27:163-7. Walsh LJ, Kaminer MS, Lazarus GS, Lavker RM, Murphy GF. Role of laminin in localization of human dermal mast cells. Lab Invest 1991;65:433-40. Mathiesen A. Preservation and demonstration of mast cells in human apical granulomas and radicular cysts. Scand J Dent Res 1973;81:218-29. Sridharan G, Shankar AA. Toluidine blue: A review of its chemistry and clinical utility. J Oral Maxillofac Pathol 2012;16:251-5. Culling CF, Allison TR. Cellular Pathology Technique. 4th ed. London: Butterworths; 1985. Ankle MR, Kale AD, Charantimath S. Comparison of staining of mitotic figures by haematoxylin and eosin-and crystal violet stains, in oral epithelial dysplasia and squamous cell carcinoma. Indian J Dent Res 2007;18:101-5. Rakesh S, Vidya V, Janardhanan M, Vinod Kumar RB, Savithri V. Analysis of mast cell counts in oral leukoplakioa. Oral Maxillofac Pathol J 2012;3:181-5. Oppenheim JJ, Francis W, Rus WF, Faltynek C. Cytokines. In: Stites DP, Terr AI, Parslow TG, editors. Basic and Clinical Immunology. 8th ed., Ch. 9. London: Appleton and Lange Publication; 1994. p. 105-21. McNeil PH, Frank Austen K. The biology of mast cells. In: Frank MM, Austen KF, Claman HN, Unanue ER, editors. Samter's Immunologic Diseases. 5th ed., Ch. 13. Boston: Little Brown and Company; 1995. p. 185-204. Jandinski JJ, Sonis S, Doku HC. The incidence of mast cells in selected oral lesions. Oral Surg Oral Med Oral Pathol 1972;34:245-8. Oliveira-Neto HH, Leite AF, Costa NL, Alencar RC, Lara VS, Silva TA, et al. Decrease in mast cells in oral squamous cell carcinoma: Possible failure in the migration of these cells. Oral Oncol 2007;43:484-90.